I am currently reading the book of Jeremiah. I believe the Old Testament is an important part of the Christian life and am saddened that a good majority of believers in America today feel that it is irrelevant for our lives today. I noticed in Jeremiah 23:19 that God mentions "... a whirlwind of the Lord is gone forth in fury, even a grievous whirlwind..." and of course I started thinking. I recently watched (again) a documentary on the Dust Bowl. 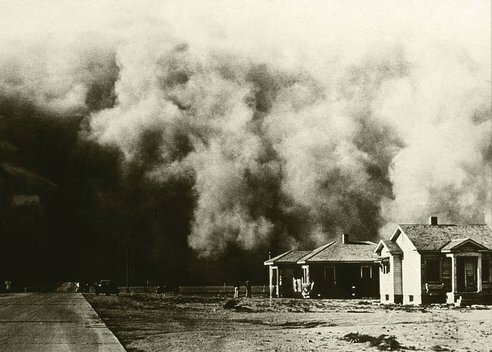 Ever since I first heard about the Dust Bowl that took place in the U.S. in the 1930's I have been intrigued by it. Yes, even drawn to it! I am in awe every time I think about this disastrous phenomenon. It was just so much bigger than anyone or anything ever known before. It takes my breath away to think about being there and witnessing something so huge. I always feel so small deep down inside. I love that feeling. I love being presented with something so much bigger than myself because it makes me stop and consider just how very incomprehensibly big God is. Somehow that feeling reminds me that I am safe because no matter how big whatever I have been presented with is, or no matter how much it takes my breath away I know that God, my Father, is so much bigger. In fact He is the one who created the things in this world that I consider "BIG". Maybe that is why God uses big things in nature in His Word to describe things because he wants to remind us how very small we are so that we will be humble and how big He is so that we will be comforted.